This is a lovely, fresh, light cake which I credit Mary Berry for. I think it looks nice just dredged with icing sugar, but you could ice the cake by doubling the icing quantity if you prefer. My tip: Ensure that when you pulp the orange that you don’t have largish chunks left as these can be rather bitter and unsightly. Preheat the oven to 180C/fan 160C/gas 4. Grease and base-line two deep 20cm tins with greased greaseproof paper. Place the whole orange in a small saucepan, cover with boiling water and simmer until soft, about 20 minutes. Set aside to cool. When the orange is soft and cold, cut in half and remove any pips. Process the whole orange, including the skin, until medium chunky. Reserve 2 level tablespoons of the orange pulp for the icing, and leave the rest in the processor. Add the remaining cake ingredients and blend until smooth. Avoid overmixing. Divide the mixture evenly between the two tins. Leave to cool in the tins for a few moments, then turn out, peel off the paper and finish cooling on a wire rack. To make the orange filling, cream the soft butter, then add the sieved icing sugar and reserved orange pulp. 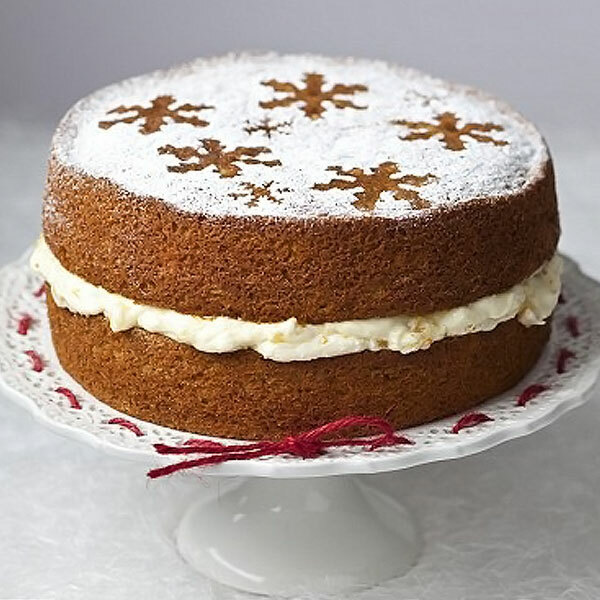 Sandwich the cakes together with the icing, and sieve icing sugar over the top of the cake. TIP – Thin-skinned oranges are usually smaller – avoid using Jaffa oranges as they have a very thick pith. PREPARING AHEAD – Best eaten freshly made but it will store in an airtight container for 2-3 days. You could also freeze the filled cake for up to 2 months. Thaw for 2-3 hours at room temperature.